Full close streamline lamp body design completely meets the demand of the sterilization and high standard of laminar flow purification in the operation room. The lamp-chimney is made of aluminum alloy; adopt ultrathin and streamlined shape design; air drag much smaller, curve and slippy surface to prevent deposition of dust, convenience to purify air, to reach the surgery surface of wound smoothly. Adopt ultrathin and streamlined shape design; the thickest part is no more than 18cm,which can acquire magnificent laminar flow effect. Main Light head adopt 48pcs LEDs+96pcs LEDs,Vice light head adopt 24pcs LEDs+48pcs LEDs(lamp cup one main bulb+ 2 vice LEDs structure), divided into multiple independent illuminant group, every lamp use double CPU control, every group controlled by LED illuminant possess special circuit chip, any group failure will not affect the normal use of shadowless lamp. Use warm white advanced international LED as shadowless illuminant, environmental, lower energy consumption LED bulb, bulb type at least 60000 hours. The light of LED provide a perfect control of shadow, no matter what the position of the operation, the overlapped light technology can really achieve shadowless lighting. 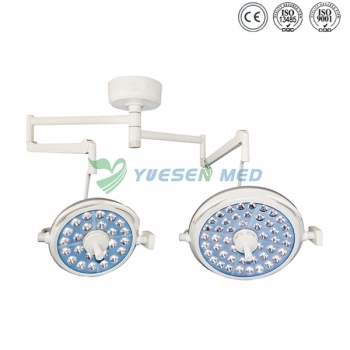 LED do not engender infrared ray and ultraviolet radiation, halogen free shadowless light caused the temperature rise and damage of tissue can accelerate the wound healing after surgery, and has no Radiation pollution. Micro computer digital control, illumination can be adjustable; Stepless adjusted, 8 steps continuous indicating, adjustment range: 10-100% , has backlight illumination: at least 30 Lux; it offers illuminance memory function. 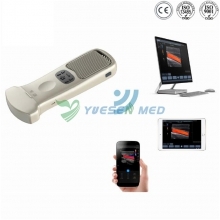 Adopt restrain interference of electromagnetic wave design, avoid disturb with the other equipment in operating room. Use satlite oval swing pipe design, can install 4 cantilever devices in multiple complex operating room, also can be obligate per hospital request, convenient to upgrade and provide the perfect solution for the increasing multi-media request of hospital. Balanced system optional adopt German ondal import arm module, more than 5 group joints move together, every cantilever has more than 3 joints, can be rotated in 360 degree, possess fatigue correcting unit and fix position hand handle device, easy to fix position timing after long time use. 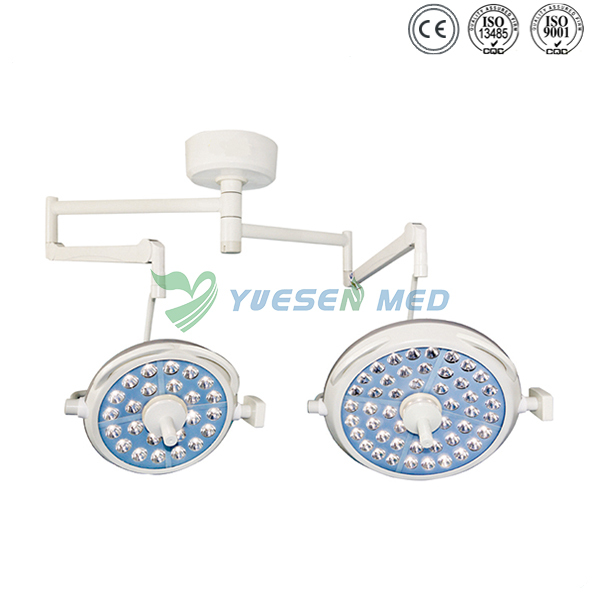 The handle on the central of lamp can be detachable, can take high temperature (no more than 134 centigrade) sterilization treatment, easily adjust, flexible fixed; adopt balanced arm, handy operate, and insure the lamp stable in the operation; has C-arm joint control panel, possess luminance prompt facility, provide environment lighting models. lamp body was treated by anti-rust& anti-corrosion treatment,could be treated by disinfectant solutions. 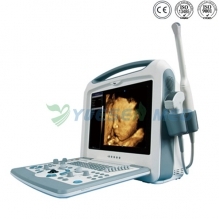 Lamp optional with Lighting mode for Laparoscopy, Offer the perfect lighting for deep illumination. Lamp panel radius of gyration:at least 182cm, the lamp can be pulled to vertical floor,convenient to any angle illumination. Unify ABS operate handle and mid-operation handle of Lamp rim. Product execute international IEC standard.